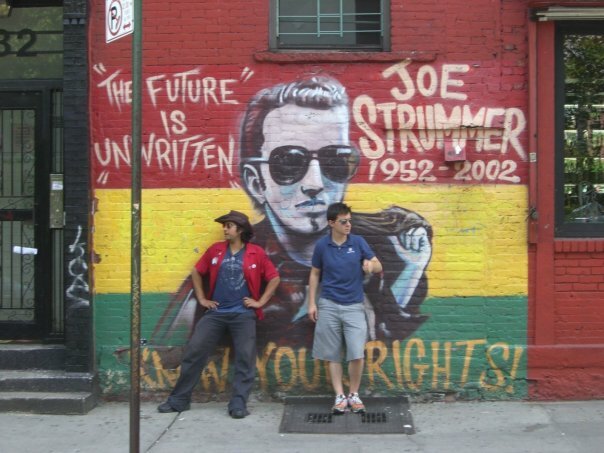 Joe Strummer Tribute, 7th and Ave. A.
I love New York City and I love history. Born and raised here, restlessness pulled me away at first opportunity, but like every time since, the City’s energy pulled me back. The summer between my first and second year of college I interned at the Historical Signs Division of the New York City Parks Department. Then run by legendary Parks Commissioner Henry Stern, our troupe was tasked with generating historical signs to the city’s (approximately) 2001 parks, each of which would bear the name of outgoing Mayor Giuliani in perpetuity. You can see these signs at the entrance to your local park, playground or traffic triangle. Some are for famous people, others for forgotten World War I veterans from the South Bronx. It takes all types to build such a strange organism. Walking around the City, maybe you’ve wondered who Stuy-town is named for. Or how the subways got built. Or why certain people live in certain neighborhoods, or did before gentrification. As I argue in today’s article about the black community’s historical relationship with the NYPD, these facts matter. Millions of people who have come and gone shaped the place that now shapes us. The City has certainly given me its best and its worst, and in creating this site, maybe I can dish a little back. After a rough and tumble 2014, I need a break from politics and the law, my day jobs for the last decade. This site will be a hard-edged look at New York City’s wild, colorful and boundless history, and why it matters today. For centuries this has been a city of finance, real estate, fashion, music and news- the center of the world. Despite this proximity to power, or perhaps because of it, New York City has also been a center of dissent- political, social and cultural. These are the stories that excite me most. The rebellion inspired by the mad energy of Gotham. And why we call it Gotham. Stay tuned for details about the site’s launch, currently slated for mid-January 2015, on our Events page.